Bankruptcy filings nationwide continued their customary January trend of decline, according to January 2016 AACER bankruptcy data reported by Epiq Systems on Thursday. For the first month of the new year, bankruptcy filings totaled 52,522, which was 6,570 lower (11 percent) than the total for January 2015. The number of filings had declined year-over-year in every January since 2011, making six Januarys in a row that there were fewer bankruptcy filings nationwide than in January of the previous year. January 2016’s total of 52,522 was about 49 percent lower than the peak total of 102,838, recorded in January 2010. In January 2016, bankruptcy filings per day totaled 2,764 per day over 19 filing days, which was down over-the-year from January 2015’s total of 2,955 filings per day. For the full year of 2015, filings totaled 3,264 per day over 251 filing days, for a cumulative total of 819,240 (an average of 68,270 per month). California, the top state for cumulative bankruptcy filings in 2015, had the most in January 2016 of any state with 5,091—nearly one-tenth of all filings in the nation during the month. Illinois was second with 3,743, followed by Georgia (3,489), Florida (3,439), and Texas (2,577). 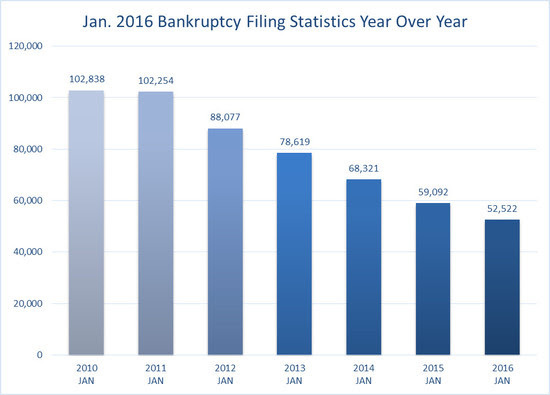 Ohio, which was fifth among states in bankruptcy filings for December 2015, fell to seventh in January with 2,229. The state with the fewest bankruptcy filings in January 2016 was Alaska with 17. Just as they did each month during 2015, Tennessee and Alabama ranked first and second among states in filings per capita for January with 4.82 and 4.35 for every 10,000 people, respectively. These numbers were substantial declines from December’s totals of 5.73 and 5.36, respectively. The national average of filings per capita in January 2016 was also significantly lower over-the-month at 2.02, compared to 2.63 in December.